Beetroot is the most intense colour! Sorry for the lateness of my blog but I have been doing some house keeping on my stitchery room and also dying some precious vintage French linen to use for butterfly wings! 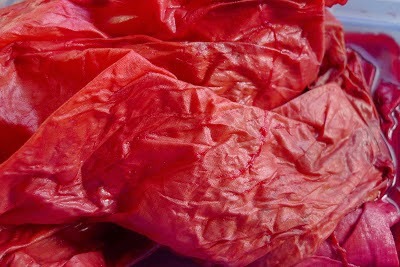 I peeled some beetroot's and then boiled them in water for several hours this morning and then drained the liquid off to put my fabric in. I also made my linen wet and soaked it in water with a little salt so that it would take the dye. I am hoping when it is dry it will look wonderful. I would like to embroider it with white hand dyed shaker thread so that it show up..... I am hoping for great things. This is a slightly messy process compared to tea dying but I am very happy with the raspberry colour results. So now it is drying and I can report rubber gloves are needed and one of my wooden spoons will never be the same again!! but I am thrilled with the results. So you can give it a go with confidence. I'm going to trying this!! Give it a go Gil... The results are amazing!